Dorie Greenspan's Rugelach Secrets Forget the last-minute shopping, put down the tinsel, and never mind the horde of relatives on the way. It's time to make holiday cookies. 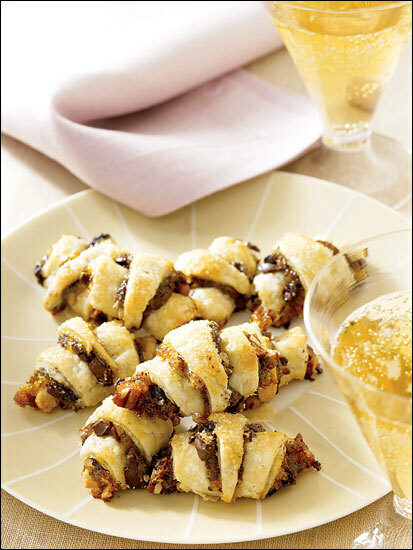 Baker and cookbook author Dorie Greenspan shares a wealth of baking tips for making rugelach. 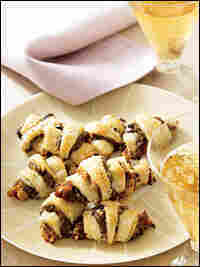 Fillings for rugelach include cinnamon-sugared nuts, jam, currants and chopped chocolate. Scroll down for recipes. Forget the last-minute shopping, put down the tinsel, and never mind the horde of relatives on the way. It's time to make holiday cookies. Baker and cookbook author Dorie Greenspan joins Michele Norris in her Washington, D.C., kitchen to talk about the holidays and share a wealth of baking tips for making rugelach. The popular crescent-shaped cookies can be filled with anything from raspberry jam to cinnamon and sugar or chocolate and nuts. Greenspan writes the "Tools of the Trade" column for Bon Appétit magazine and is the author of several cookbooks, including Paris Sweets: Great Desserts from the City's Best Pastry Shops, and Baking with Julia. 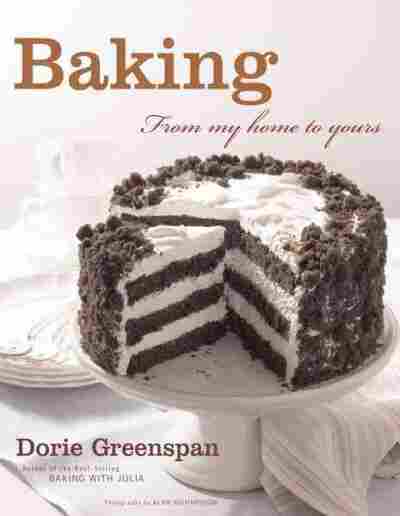 Her most recent book, Baking: From My Home to Yours, applies her years of professional experience to baking at home. Greenspan says that it's not just the taste of her favorite cookies that evoke the holidays for her, it's the process of making them. Sometime during the first year of my marriage, I visited my mother-in-law in her kitchen. There she was, listening to the radio, whistling (she is a formidable whistler) and rolling cream cheese dough around raisins and nuts to form the crescent-shaped cookies known as rugelach. I was spellbound — I'd had no idea that rugelach could be made at home. As far as I knew, rugelach, like ketchup or ships-in-bottles, were made only in laboratories. But here was my mother-in-law shaping the cookies with ease. And a short time later, there I was, eating them with ease. These cookies weren't like the rugelach my mother bought every week at the local German bakery — they were much better. I was so excited I asked for the recipe. My mother-in-law wrote it out in her precise hand on a 3-x-5 index card. And, as she wrote, she told me that this recipe was not exactly the same as the one her mother used, that it had come from Mrs. Strauss, her next-door neighbor, and that she was sure I'd have no problem making the cookies as long as I didn't overmix the dough. She was right. I was a newcomer to the world of baking, but I had no problem with the dough, the only potentially tricky part of the process. Since then, I've made rugelach countless times, but nowadays my dough is even more foolproof because I make it in a food processor. I've also made a few other changes to the recipe. While my mother-in-law's rugelach were filled with cinnamon-sugared nuts, mine also include a slick of jam, some currants and a handful of chopped chocolate. This is a very old recipe, and I have no doubt that everyone who has made it has added or subtracted a little bit to make it her own — and my mom-in-law, Mrs. Strauss, and I expect you to do the same. Put the flour and salt in a food processor, scatter over the chunks of cream cheese and butter and pulse the machine 6 to 10 times. Then process, scraping down the sides of the bowl often, just until the dough forms large curds — don't work it so long that it forms a ball on the blade. GETTING READY TO BAKE: Position the racks to divide the oven into thirds and preheat the oven to 350 degrees F.
TO GLAZE: Stir the egg and water together, and brush a bit of this glaze over each rugelach. Sprinkle the cookies with the sugar. What you call the fabulously buttery, slightly gritty, tender, sandy-textured cookies that are so right with tea or coffee may depend on where you live. In France, the cookies are known as sables, galettes or palets; in Scotland, they're shortbread; and here, at home, they are shortbread, sand tarts or simply butter cookies. At their most elemental and traditional, shortbreads and their kin are made of butter, sugar — either granulated or confectioners', or a combination of the two — and flour. And, although some recipes have an egg or two, or maybe just yolks, it's not the eggs that define the cookies, it's the other ingredients and, most important, how you handle them. 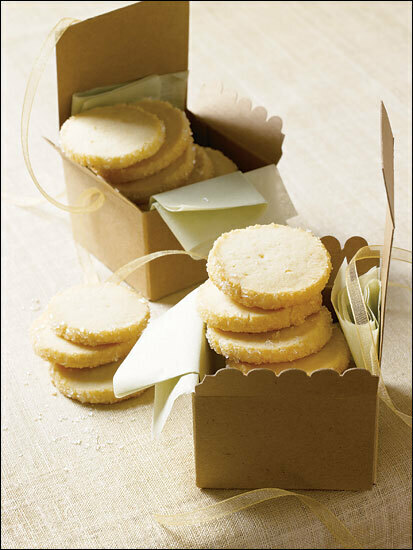 Here's all you need to know to get perfectly crumbly shortbread or sables every time. Use fresh butter that is soft, but not at all greasy -- if your butter is sitting in an oily puddle, it's gone too soft and your sables won't have their characteristic sandiness. Don't beat the butter (or the butter, sugar and eggs) so enthusiastically that the mixture is light and fluffy. You don't want to beat air into this dough, because it would cause the cookies to puff as they bake in the oven and sink as they cool on the counter. Be soft and gentle when you blend in the flour. This is the make-or-break step in the process. With the word "sandy" singing in your head, add the flour all at once and mix it only until it disappears into the dough. To guard against overmixing, you can mix in the last of the flour by hand. Shape the dough as the recipe directs and then make sure to give it a good, long chill; it will improve the flavor of the cookies and help them keep their shape under the oven's heat. Try to refrigerate the dough for at least 2 hours, but know that longer is better. Cool the cookies completely before you serve them. As seductive as the smell of warm butter, sugar and flour is, the cookies taste better when they reach room temperature. Sables, rich, tender shortbread cookies, are as popular in France as chocolate chip cookies are in America. And for several good reasons: the pure flavor of butter, the cookie's key player; a paradoxical but paradisical texture -- the cookie is both crumbly and melt-in-your-mouth tender; and it has an anytime rightness that makes it as perfect with a tall glass of milk, a bowl of ice cream or a basket of berries as it is on a petits fours tray in France's grandest restaurants. I learned to make sables in Paris working with some of the city's best patissiers, and this master recipe is based on what they taught me -- the Playing Around variations are my American riffs on their standard. The dough for sables is shaped into logs and then sprinkled with sugar before it is sliced and baked. During the year, I coat the logs with sparkly white decorating sugar. When the holidays come around, I double the recipe and go mad with color, sprinkling some of the logs with brilliant red sugar, some with green and some with a rainbow mix. Trimmed in color and packed in festive tins, these make terrific Christmas cookies. If you're new to sables, take a look at the pointers (at left) before you set to work. Working with a stand mixer, preferably fitted with a paddle attachment, or with a hand mixer in a large bowl, beat the butter at medium speed until smooth and very creamy. Add the sugars and salt and beat until well blended, about 1 minute. The mixture should be smooth and velvety, not fluffy and airy. Reduce the mixer speed to low and beat in 2 of the egg yolks, again beating until the mixture is homogenous. Turn off the mixer. Pour in the flour, drape a kitchen towel over the stand mixer to protect yourself and the counter from flying flour and pulse the mixer at low speed about 5 times, a second or two each time. Take a peek -- if there is still a lot of flour on the surface of the dough, pulse a couple more times; if not, remove the towel. Continuing at low speed, mix for about 30 seconds more, just until the flour disappears into the dough and the dough looks uniformly moist. (If most of the flour is incorporated but you've still got some in the bottom of the bowl, use a rubber spatula to work the rest of the flour into the dough.) The dough will not clean the sides of the bowl, nor will it come together in a ball -- and it shouldn't. You want to work the dough as little as possible. What you're aiming for is a soft, moist, clumpy (rather than smooth) dough. Pinch it, and it will feel a little like Play-Doh. Remove a log of dough from the refrigerator, unwrap it and place it on a piece of parchment or wax paper. Whisk the remaining egg yolk until it is smooth, and brush some of the yolk all over the sides of the dough -- this is the glue -- then sprinkle the entire surface of the log with decorating sugar. Trim the ends of the roll if they're ragged, and slice the log into 1/3-inch-thick cookies. (You can make these as thick as 1/2 inch or as thin as -- but no thinner than -- 1/4 inch.) Place the rounds on the baking sheets, leaving an inch of space between them. Bake one sheet at a time for 17 to 20 minutes, rotating the baking sheet at the midway point. When properly baked, the cookies will be light brown on the bottom, lightly golden around the edges and pale on top; they may feel tender when you touch the top gently, and that's fine. Remove from the oven and let the cookies rest a minute or two before carefully lifting them onto a rack with a wide metal spatula to cool to room temperature. SERVING: Serve these with anything from lemonade to espresso. STORING: The cookies will keep in a tin at room temperature for about 5 days. If you do not sprinkle the sables with sugar, they can be wrapped airtight and frozen for up to 2 months. Because the sugar will melt in the freezer, the decorated cookies are not suitable for freezing. PECAN SABLES: Reduce the amount of flour to 1 1/2 cups, and add 1/2 cup very finely ground pecans to the mixture after you have added the sugars. (In place of pecans, you can use ground almonds, hazelnuts or walnuts.) If you'd like, instead of sprinkling the dough logs with sugar, sprinkle them with very finely chopped pecans or a mixture of pecans and sugar. SPICE SABLES: Whisk 1 1/2 teaspoons ground cinnamon, 1/2 teaspoon ground ginger and 1/4 teaspoon freshly grated nutmeg into the flour. When I included these in Paris Sweets, they were called Korova Cookies and they instantly won fans, among them my neighbor Richard Gold who gave them their new name. Richard is convinced that a daily dose of Pierre's cookies is all that is needed to ensure planetary peace and happiness. Turn off the mixer. Pour in the flour, drape a kitchen towel over the stand mixer to protect yourself and your kitchen from flying flour and pulse the mixer at low speed about 5 times, a second or two each time. Take a peek -- if there is still a lot of flour on the surface of the dough, pulse a couple of times more; if not, remove the towel. Continuing at low speed, mix for about 30 seconds more, just until the flour disappears into the dough -- for the best texture, work the dough as little as possible once the flour is added, and don't be concerned if the dough looks a little crumbly. Toss in the chocolate pieces and mix only to incorporate. Working with a sharp thin knife, slice the logs into rounds that are 1/2 inch thick. (The rounds are likely to crack as you're cutting them -- don't be concerned, just squeeze the bits back onto each cookie.) Arrange the rounds on the baking sheets, leaving about 1 inch between them. Bake the cookies one sheet at a time for 12 minutes -- they won't look done, nor will they be firm, but that's just the way they should be. Transfer the baking sheet to a cooling rack and let the cookies rest until they are only just warm, at which point you can serve them or let them reach room temperature. SERVING: The cookies can be eaten when they are warm or at room temperature -- I prefer them at room temperature, when the textural difference between the crumbly cookie and the chocolate bits is greatest -- and are best suited to cold milk or hot coffee.